QuickBooks is a small business accounting software program businesses use to manage sales and expenses and keep track of daily transactions. You can use it to invoice customers, pay bills, generate reports for planning, tax filing, and more. The QuickBooks product line includes several solutions that work great for anyone from a solopreneur to a mid-sized business. Since there are several QuickBooks solutions, it’s important that you pick the right one. Before you commit, take QuickBooks for a spin by signing up for a free 30-day trial; the trial is a fully-functional version of QuickBooks, so you can test all of the bells and whistles. Best of all, no credit card is required. Small business owners typically use QuickBooks to manage their invoices, pay their bills, and track their cash flows. They also use it to generate month- and year-end financial reports as well as prepare for quarterly or annual business taxes. It’s common for business owners to manage QuickBooks themselves or use an in-house or outsourced bookkeeper. QuickBooks automatically keeps track of your bills and expenses by connecting your bank and credit card accounts to QuickBooks so all of your expenses are downloaded and categorized. If you need to track a check or cash transaction, you can record it directly in QuickBooks in just a few minutes. QuickBooks will also help you pay your bills when they’re due. For example, you can ensure that you pay your bills on time by creating an Accounts Payable Report in under two minutes. This report will provide you with the details of your current and past due bills so that you can be sure to quickly address any issues. 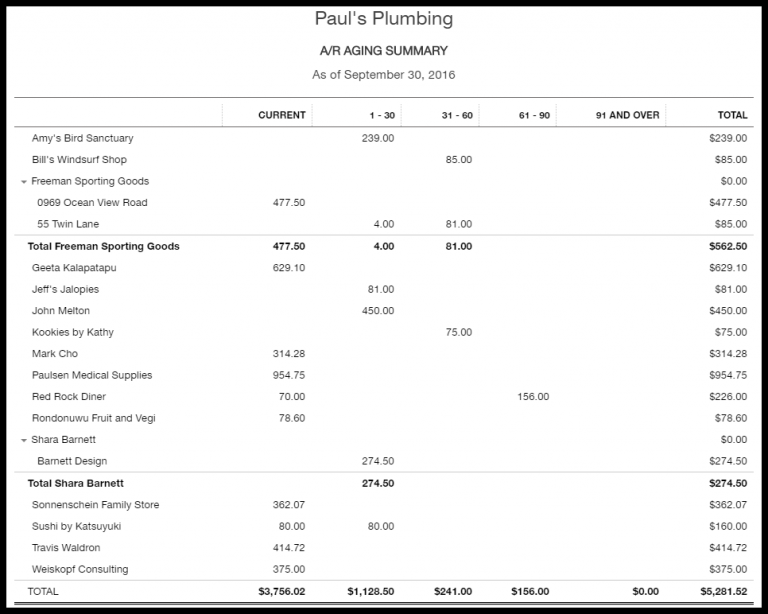 Below is a sample A/P Aging Report from QuickBooks. 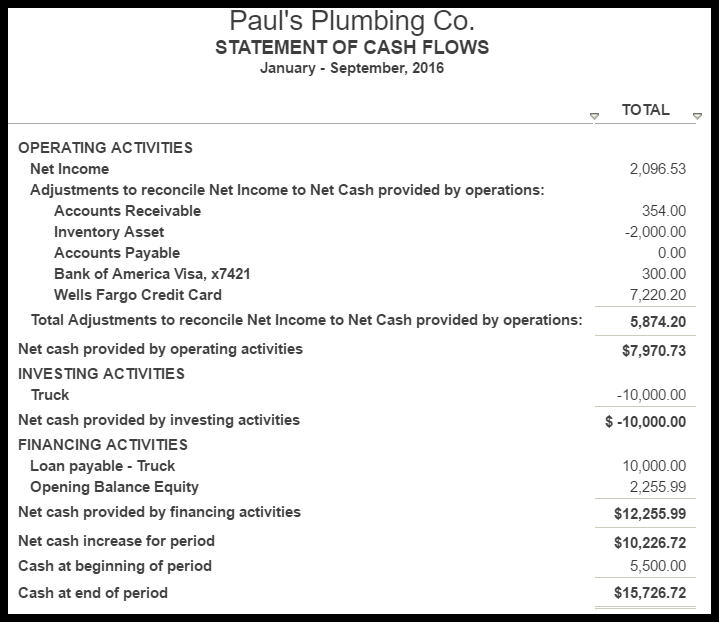 By managing all of your cash inflow and outflow activities in QuickBooks, you are able to access several reports that provide valuable insights into your business. All of the reports are pre-built in QuickBooks and can be run in just a few clicks; reports are updated in real-time as you enter and save transactions. Below, you will find a brief description of each of these reports along with a snapshot of what it looks like in QuickBooks. The best part about using QuickBooks payroll is that it is integrated with QuickBooks so your financial statements are always up-to-date as of the latest payroll run. The purchase of a QuickBooks payroll subscription is required so that you have access to the latest payroll tax tables to calculate employee and employer payroll taxes. While keeping track of inventory is doable in an Excel spreadsheet, it can be very time-consuming. 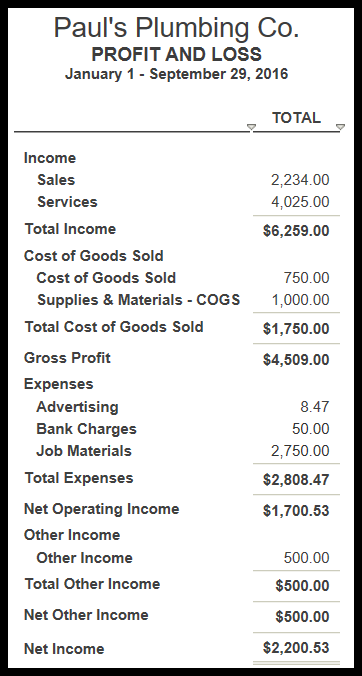 Below is a sample Inventory Valuation Summary Report from QuickBooks. This report shows a list of your inventory products, quantity on-hand, average cost, and their total value. Here at Fit Small Business, we use QuickBooks Online to manage all of our business accounting and taxes. We have set up our tax professional with a user id and password to access our QuickBooks data and pull the information they need to file our tax returns. Since everything is tracked in QuickBooks, we do not spend a lot of time organizing receipts and bank statements. This not only ensures that we have accounted for all income and expenses, but also improves accuracy as a result. One of the best ways to improve your cash flow is to offer customers the option to pay their invoices online. With QuickBooks, you can add the Intuit Payments feature with a simple click of a button. Once activated, all customer invoices that you send via email will include a “Pay Now” button. Your customer can click on that button and pay their invoice using any major credit card or by entering their bank account information to authorize an ACH payment directly from their bank account. Another key to making tax time a breeze is being able to organize your receipts in QuickBooks. All QBO subscribers can download the QuickBooks App to their mobile device for free, take a picture of a receipt, and upload it to QBO in just a few minutes. No more lost receipts or manually matching up receipts with downloaded banking transactions. QuickBooks allows you to attach a receipt to the corresponding banking transaction! You can upload an unlimited number of receipts to QBO to store in the cloud along with your data. This can be really helpful for companies who track a lot of expenses, like lawyers and law firms. The QuickBooks product line includes QuickBooks Online, QuickBooks Desktop, QuickBooks Self-Employed, and QuickBooks Mac. Each of these offers a variety of features that start at a monthly fee of $10 or a one-time fee between $299 and $1,500. To help you narrow down which one is right for you, check out the summarized table below. QuickBooks Online is a cloud-based product that does not require software installation. This QuickBooks product is available in three subscription levels (Simple Start, Essentials, Plus), and it is ideal for any service-based business that does not have complicated invoicing requirements. QBO allows you to access your data from any computer with an internet connection using your secure login. Visit our free QuickBooks Course to sign up for a free trial and to learn how to use QuickBooks. QuickBooks Desktop comes in three versions (Pro, Premier, Enterprise). All three versions of this QuickBooks product require you to install software on your computer. QuickBooks Pro is ideal for most small businesses that do not manufacture products. QuickBooks Premier is ideal if your business falls into one of these industries: manufacturing, contractor, retail or nonprofit. QuickBooks Enterprise is for large enterprises. These industry-specific versions of QuickBooks include a custom chart of accounts and reports for these industries. We break down each of these products to help you understand what QuickBooks is in our QuickBooks Desktop comparison article. 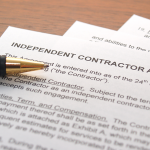 QuickBooks Self-Employed is the ideal product for freelancers, realtors and Uber/Lyft drivers. Similar to QuickBooks Online (QBO), it is a cloud-based product that can be accessed from any computer with an internet connection and your secure login. It includes unique features that are not available in QBO and QuickBooks Desktop, like the ability to separate business from personal expenses, track miles and transfer data to TurboTax. QuickBooks Self-Employed will calculate your estimated quarterly tax payments and remind you when they are due. There are two QuickBooks Self-Employed pricing plans; to learn more about them, check out our QuickBooks Self-Employed guide. QuickBooks Mac (QB Mac) is the only desktop product available for Mac users. If you don’t want to go with QBO and you have a Mac computer, then you have to go with QB Mac. This product is very similar to QuickBooks Pro, and it is ideal for most small businesses that do not manufacture products. Check out our article on QuickBooks Mac to learn more about QuickBooks Mac. If you’re still trying to understand the answers to the questions about what QuickBooks is or what it does, we have the answers for you. If you don’t see your question, head over to the Fit Small Business forum and post your questions there. We answer questions from small business owners like you every day! What Is QuickBooks Used For? QuickBooks is an accounting software used broadly by small businesses. QuickBooks is used for everything from running payroll to tracking income and expenses to putting together financial reporting packages and more. Plus, QuickBooks automates time-consuming processes, like preparing bank reconciliations, and you don’t have to be an accountant or bookkeeper to use it. What’s the Difference Between Quicken & QuickBooks Accounting Software? The primary difference between Quicken and QuickBooks is that Quicken is designed to keep track of your personal budget and spending. While a few people use Quicken to keep track of business income and expenses, it does not have the capability to manage sales to your customers nor track inventory like QuickBooks does. Do I Have to Be an Accountant or Bookkeeper to Use QuickBooks? You do not have to be an accountant or bookkeeper to learn how to use QuickBooks. This is one of the many features that sets QuickBooks apart from its competitors. It has a user-friendly interface and simple terminology that make it easy to navigate and use. Get up to speed quickly with our FREE QuickBooks Online training tutorials. How Do I Get a Crash Course in Bookkeeping? While you don’t need a bookkeeping background, it can’t hurt to take a crash course. 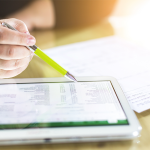 Check out our small business bookkeeping guide to understand some bookkeeping basics, such as ways to track cash inflow and outflow, how to set up a chart of accounts, and how to read financial statements. Businesses can use QuickBooks accounting software for all of their financial tracking and reporting needs. To get started, you simply need to purchase the QuickBooks product that is right for your business, customize it to fit your business needs, and start using it. In fact, you don’t need an accounting degree to learn how to use QuickBooks. There are a number of free and paid QuickBooks training resources to help you get up to speed on QuickBooks. If you’re thinking about getting a subscription and are interested in a cloud-based solution, head over to QuickBooks Online Comparison; in this article, we cover the three online solutions available (subscription prices start as low as $20 per month). If you’re still on the fence about whether to go with Online or Desktop, check out our article on QuickBooks Online vs. Desktop: Which Is Right for You. We have discussed what QuickBooks is and several options that will teach you how to use QuickBooks. Be sure to do your homework by reviewing the resources we have discussed to help you pick the right solution for your business. Before you commit, take QuickBooks for a spin by signing up for a free 30-day trial; the trial is a fully-functional version of QuickBooks so you can test all of the bells and whistles. Best of all, no credit card is required. Useful information. Very useful guide for those who are new to Quickbooks or are planning to buy the software. Good work! Hey Jason! Glad you enjoyed the What Is QuickBooks article. Thanks so much for reading! Thanks very much. it is very useful for business, the given information is very good. Hi Vandana, thanks again for your compliment and for reading our articles! I read your article, it gives the way to handle accounting task easily in an organization. Hi Jac, glad you enjoyed the article!